The number one sauce, and usually the only sauce, that is served at the table for an asado is the chimichurri. Think of it as the ketchup, mustard, mayonnaise, soy sauce, fish sauce, hot sauce, barbecue sauce, or whatever table-side condiment of Argentina barbecue. Dollops are spooned on top of meats or drizzled onto bread to make a mini sandwich. Some even choose to use it as a marinade or a basting sauce. Judging by the ingredients, you might say to yourself that this looks like an adobo. For the most part that is correct. Many adobos do contain the same ingredients. However, the difference lies in preparation and time. Like a fine wine, chimichurri only gets better the longer it sits. Also, the ingredients are more roughly cut or chopped to give it a chunkier consistency than adobos. First of all, chimichurri must have a good liquid base. Containing one or more of the following ingredients: oil, vinegar, red wine, and brine (salt & water). Second, chimichurri needs to have at least one herb*. Parsley and oregano are the most popular. Third, you need to at least have some garlic for extra punch. There you have it. Chimichurri, at its most basic level could be oil (vinegar or salt water), parsley, and garlic. Think of that as a master recipe to use as is or to build upon. *Note: I’ve seen a lot of recipes produced outside of Argentina calling for the inclusion of cilantro and referring to the sauce as Argentinean chimichurri. Although cilantro may be mixed into various dishes by chefs and home cooks in Argentina, particularly in the Northern regions, and continues to gain popularity, it is not an herb that has been traditionally used throughout most of the country. A person here or there may include cilantro in their own chimichurri recipe but ask any Argentinean and they will probably scream blasphemy! 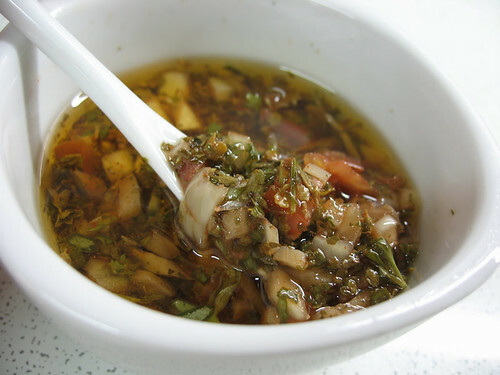 Chimichurri with cilantro is more like pebre, a Chilean sauce that is used in the same manner. Everyone has their own special idea of what they consider to be the best chimichurri. Some prefer mostly liquids with just a hint of herbs and spices, while others prefer just the opposite. I prefer the chunky style and you can find my favorite chimichurri recipe here. Also check out this parsely-garlic chimichurri. Here are some additional ingredients that one may find in chimichurri. If you ever happen to eat an asado in Argentina or at an Argentinean steakhouse, you’ll find the ingredients used don’t stray far from what is on that list above. That is not to say, however, that you will not find variations with other ingredients or that there is a set rule of what you can or cannot include. Some regions may add additional herbs and spices that reflect their local cuisine or it might just be a matter of personal preference. Now, go experiment, have some fun, and create your own special version that sets you apart from the rest.